Greece is known for its intriguing mythological stories, archaeological ruins, colorful islands, sunny beaches, charming villages, and exceptional natural beauty. Its most appealing charm can be found in the corners of the Greek islands. 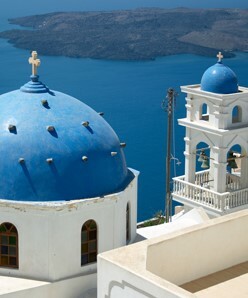 Athens, Mykonos, Santorini,Chania, Patmos - and they are all included in this cruise! Fascinating archaeological treasures, sunny beaches, crystal-blue water, and much more await you on this marvelous Greece cruise.This immersive voyage is like a “greatest hits” package of Greece: incredible cities, historic sites, picture-perfect villages, and friendly seaside tavernas—plus a luxurious day at sea for relaxing and recharging. It begins in one of the world’s oldest cities, Athens, where a treasure trove of ancient landmarks awaits. Next in line is Mykonos, an island that charms with shops, bars, and restaurants tucked next to traditional whitewashed homes and churches. Continue your experience with a walk in the footsteps of John the Apostle on the holy island of Patmos, and prepare yourself for some of the best sunsets in the world in Santorini. Next it’s on to Chania and its Venetian harbor, Minoan ruins, Byzantine churches, and the amazing Samaria Gorge. Then set sail for the verdant island of Zakynthos, with its massive limestone cliffs and surreal turquoise waters, while Igoumenitsa is a lush lively city, where you can stroll the sandy stretches of Drepanos and Makrygiali or explore the Monasteries of Meteora. And enjoy a late-night stay in Kotor, one of the best-preserved medieval towns in the Adriatic. The journey ends with a relaxing and luxurious day at sea—perfect for pampering at Sanctum Spa or hitting the gym after all that mouth-watering Greek food—before heading to the fabulous, floating city of Venice. • Immerse yourself in the world’s most interesting places. Azamara Club Cruises boasts more overnights in ports, longer stays and night time tours. • The Mediterranean and Black Sea offer a cruise destination for those wishing for romance, culture, and fine artesian treasures. 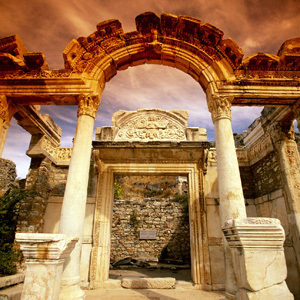 • Learn about the Greek gods and the early philosophy of Socrates when you visit the incredible ruins left in Athens, Greece. At night, go out and take in the culture with the modern Athenians. If you’re traveling solo or simply prefer to have your own stateroom when cruising with friends, Azamara offers fantastic singles rates on select voyages. Singles pay 5,998 Inside 6,798Oceanview 8,198 Balcony 10,598 Suite which includes gratuities for housekeeping, dining, and bar staff. Your private stateroom is the perfect place to relax and unwind during your Azamara cruise. We have group space, which means we have a few extra benefits, along with traveling with a congenial group of friends.